Like so much in archaeology, this game comes to us from our methodological cousins in geology. Shawn Graham adopted their game, and modified it for our use at whenonge #1. Chuck Jones had the first correct answer, and then hosted whenonge #2. The mysterious and elusive PDD got #2 right but dropped the ball and never claimed his prize, so Chuck struck back with whenonge #2.1. Paul Zimmerman got the correct answer to #2.1 and hosted whenonge # 3. Heather Baker got the correct answer to #3 and hosted whenonge # 4, and Jason Ur won that round. His challenge to you is to be the first to correctly identify, in the comments below, the site pictured above for the right to host whenonge #6. Good luck! We have a winner! Fine work, Dan. The ball in in your court Dan. Don't forget to tag it with "WhenonGE", and let us know where it is. 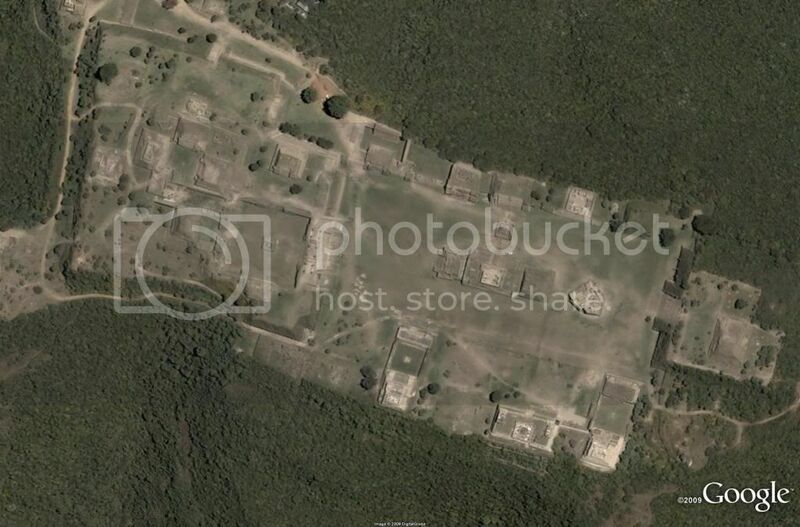 Well, I am bummed out, since I thought that I might actually win with Monte Alban and be able to post a really obscure Mesoamerican urban site. This is a great game, much more fun than writing up excavation reports. I've been looking at lots of Old World urban plans (looking for extensively excavated residential areas), and its great to see the Google Earth images.